The truth is, I was going to write a post about blood clots in the news lately. The truth is, now did not feel like the right time to share the news updates. 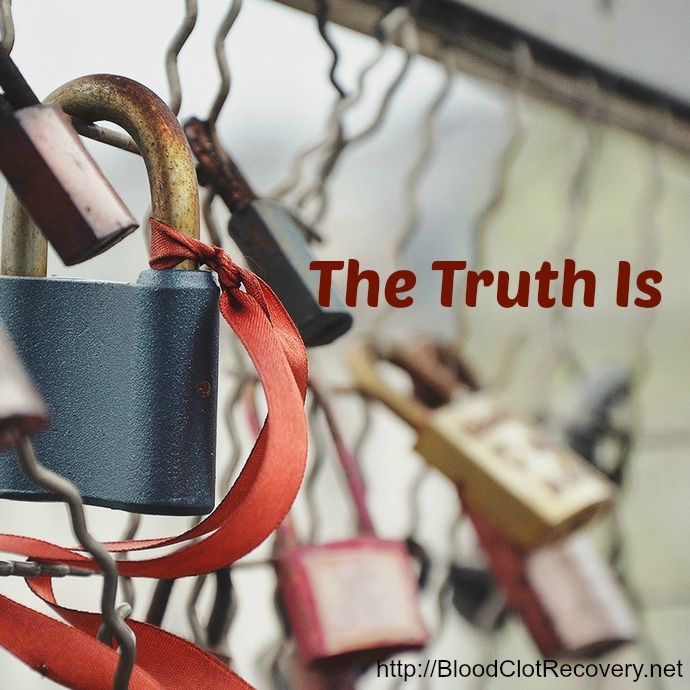 What does feel right, is sharing some truths about blood clots and recovering from blood clots. This is my message to you today. The truth is recovery is hard. Very hard. Recovering from a DVT or PE is not like recovering from a cold, flu, surgery or injury. It is more like recovering from a heart attack, stroke or cancer. There are days when I feel miserable and days when I feel great and no apparent way to know which day will fall where and when. It is hard to plan things, hard to make commitments, hard to get active, hard to eat right and hard to take care of myself. It’s even hard to get out of bed, get dressed, do my hair, go to work and drive my car. There are some days when everything is hard – no matter how simple the task. I’m not the same person I was pre-PE and I can’t ever go back to that person. Experiencing a traumatic situation that also has the potential to be deadly, changes us in a way so that we can never go back to the person we once were. Are we better or worse? I don’t know, but I do know we are different. I think about situations differently since my PE (everything requires extensive thought and weighing of actions vs. reactions); I respond differently since my PE (I am much more emotional and sensitive, if that’s even possible); and I see life differently (it’s too easy to take it for granted, I almost did and I almost didn’t get a second chance at it). The truth is recovery from a DVT and PE is hard. The truth is this hurts. Along with being hard, recovering from a DVT and PE just hurts. It hurt so bad in the beginning, I was willing to sacrifice a lung and a leg (even while being a runner) to make the pain stop. It hurt to walk, it hurt to breathe – two very basic tasks so many people take for granted. It hurt to talk, to laugh, to hiccup, to sneeze and to put on pants. As time has gone by, the physical pain has lessened for me, but the emotional pain remains. Recovering from a DVT and PE is a very lonely time and the emotional scars of that loneliness and isolation are not so much like scars yet, but more like open wounds. It hurts to have friends and even family not understand what you’re going through, why it’s taking so long to recover and why you can’t do the things you once did. It hurts to always explain why you’re tired, not well or that yes, you’re still recovering from that lung thing that happened to you. It hurts to feel like sometimes no one cares, no one will listen and no one even gets the pain you’re in. The truth is, recovering from a DVT and PE hurts. The truth is this is scary. I remain highly anxious since my DVT and PE. There are days when I am nearly convinced it is happening again because I feel a pain in my leg or a stab in my lung. There are nights when I can’t sleep because I replay the story of my PE over and over again in my head – I should have known something was not right, I should have gone to the doctor earlier; maybe if I did, I wouldn’t be in so much pain now. There are nights when I wake up from a nightmare or pain and can’t fall back to sleep because what if I don’t wake up again in the morning? Tests, scans, MRI’s, blood draws, doctors’ visits, new diagnosis, hospitalizations – are all scary. Hearing words we don’t understand like INR, D-Dimer, Factor V, APS, oxygen level, warfarin, blood thinner, bilateral, chronic and acute are scary. The truth is, recovering from a DVT and PE is scary. The truth is you are not alone. When I was first discharged from the hospital, I had never felt so alone. While I had family and a few close friends who supported me through my hospitalization, none of them have experienced a PE. None of them know exactly what it feels like. I knew no one in my personal life who had gone through what I was going through. I turned to the internet for help and found some resources there, but was still lacking in real-life, down-to-earth, recent stories of people who were going through what I was. Most people I came across, like me, had not even heard of a DVT or PE before it happened to them. I wanted to change that and created BCRN within months of my discharge. You are not alone, you are never alone. If you have a question, someone else has the same question. If you have had an experience, emotion or thought, chances are, someone else has also had it. Share, talk, communicate, find us on Facebook, share here or send me a message. This is a network of people who have been or are going through the same pains, fears, anxieties, challenges and triumphs as you. The truth is, you are not alone in recovering from a DVT and PE. The truth is it does get better. I can’t tell you when and I can’t tell you how – recovery is different for each and every person. What I can tell you is that it does get better. Now two years out from my DVT and PE, I feel remarkably better than I did at a few weeks, a few months and a year. While I still face day-to-day challenges including chronic fatigue, leg pain, difficulty breathing in hot or cold weather, regular intravenous blood monitoring, managing medication and doctors’ appointments, it is better than it was. Progress is slow and improvement feels miniscule at times (maybe because is it), but it does get better. I have to believe it will get better for you too and while we may face new challenges from here on out, I believe in time, we do get better and there is hope for recovery and healing. Reader Writes In. What is your truth? Sara, Wow! This essay is so excellent on many levels! Thank you for having the courage to write it. I hope you will sit back for a moment and just count the number of people that BRCN has helped get through what has happened to us. Count the number of times someone says “I’m so relieved to have found this blog!”. How many times they say “You and this community are the only ones that understand what I’m going through.” How many times they say “Thank you for the encouraging words!” And, also think that if only one person said these things all your efforts (and I know how much effort this takes for you!) are worth it. So, THANK YOU again and again! This blog is saving ours lives by addressing our emotions, giving us information and giving us support that we can’t get anywhere else. I do want to comment on how my PE experience/adventure has changed me. I like to describe it that “I am more of the person that I want to be.” The brush with one’s mortality does help us focus on meaning in our lives.. I find myself obsessed with asking everyone I encounter in my day what their dream is and giving them encouragement to follow it. I believe that even a thirty second conversation with the person at the grocery checkout register can give them the encouragement they need that can last for a long, long time. And, even in thirty second you can and I have had profound conversations. I have suggested some TED talks in the past on this blog. Here is another one that was unexpected in its impact on me. Its about having no regrets on one’s deathbed and how a traumatic experience like the ones we’ve been through can have a profound change on us. There is one other TED talk that I am paying attention to on getting enough sleep. I, too, was scared to go to sleep, afraid I wouldn’t wake up. It is probably still having an impact on my not getting enough sleep but it isn’t at such a conscious level as it was the first six months. Here is why we sleep and again this seems an order of magnitude more important to us in the recovery from PE where exhaustion is such a huge factor in our lives. And, yes, it does get better which makes the setbacks discouraging. My fear now is the word “chronic” and whether this is a chronic condition or if I’m going to continue to get better no matter how slowly. In six months it will be 2 years since my PE. How normal will I feel at that point? Will I keep improving after that “milestone”? My optimism says yes; my fear says no. I’m going to stick with my optimism!! Hi Cathy. Thank you so much for your very kind words about BCRN and me. I really appreciate hearing and yes, thinking about how this site has helped so many people. I am really glad we can carry on discussions about blood clots and recovery too. It helps to know there is a community of people sharing these experiences – it even helps me! I will listen to and share your TED talks too. Thank you. I am looking forward to the one about going through a traumatic experience. Sometimes I do not think the magnitude of all of this really sinks in for me until it is pointed out, as you have done. It takes a tremendous amount of time, energy and effort to manage BCRN and all of it’s avenues and yes, sometimes I do think it’s all for nothing or not worth the effort. Thank you for taking time out of your day to reaffirm WHY I am continuing to do what I do. THANK YOU! I am so very moved by this post, Sara. I’m a DVT/PE newbie and resonate with pretty much every single thing you say here. I’ll save my story for another time, but will just say that I came into this “adventure” thinking it was a one-off problem. We’d fix it and be done and get back to regular life. However, months later, I’m finding that to be very untrue. And last week was given the news, after a followup ultrasound on my leg, that my clots have decided to take up residence in my body, crap! The “chronic” word was uttered… Post Thrombotic Syndrome. So now I’m reeling from this whole idea that this is a life-changer. I’m so tired of being in pain during every waking hour, it’s really dragging me down. I’m noticing I even have some shame around it — what the heck is wrong with me that I can’t get 100% better? (I know this is irrational, of course). And I’m a positive person by nature, so it’s whacking out my whole view of everything. So thank you for being here, Sara, and being — cliche that it is — a true beacon of hope. Oh Martha, thank you SO MUCH! You truly made me smile today with your kind words about BCRN and hope. There is HOPE, I really, really believe that and I try to convey that on this site and through my writing. I went through a very hopeless time in the beginning – I thought is would never, ever get better, yet, here I am much better than I was a year or even 6 months ago. I am living proof that even when the Chronic word is said (I too have clots that will never go away at this point), there is hope for a life worth living. I am really, really glad you are here, Martha and yes, please do share your story when you are ready to do so. I hope you keep in touch with me and BCRN. Have a beautiful day! You are welcome, Janne and thank you for your comment. I really appreciate you being here and reading. Keep in touch and talk to you soon! Have a beautiful day. A wonderful article!! I’ve just admitted to having some of the same feelings written about in this article. Managing DVT is new to me so it’s nice to find out I’m not alone. It’s hard and I’m doing my part to get well. Thanks for a great article!! Thank you – and thank you very much for reading! Welcome to BCRN and no, you are not alone in your struggles. I cried when I read this! It feels so good to know that I’m not crazy for feeling all if this! You’re welcome, Linda! I am glad you could find validation in these words. Never forget – you are never alone. Thank you for sharing. Hi Dee. Thank you so much for reading and for your very kind words. I am so happy you stopped by. I am also a two-year survivor so you and I have that – and I am sure many other things – in common. We are not alone and together we can make a difference! Again, thank you so much for stopping by and I wish you the best in your continued recovery. Yvonne, The truth is, as Sara says, it does get better. Facing one’s mortality is quite difficult. One just never wants to go to sleep. But like grieving, it never goes away but the fear dulls over time so it becomes manageable and something that makes you wiser and more caring. The truth is your family needs you. Be patient with yourself. Know that it will get better over time and some day you just may wake up one morning and realize you feel “normal”. Wow is that a neat feeling. Thank you Sara. Once again, you have expressed my very thoughts and feelings. What kind of tests do you have after stopping your anticoagulants INR/D-Dimer, ? In my part of the world, I have to take my treatment more or less in my own hands by making requests and sometimes demands to my doctor. Please help.